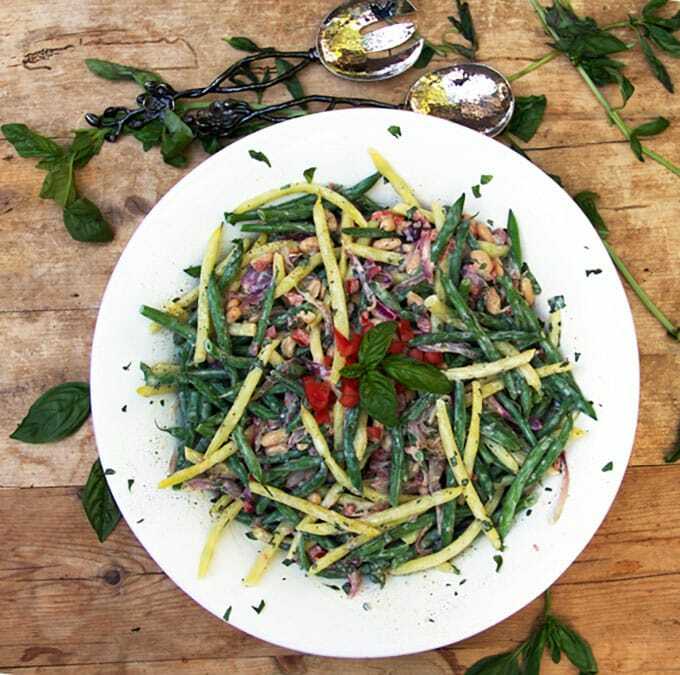 This three bean salad recipe is packed with delicious nutritious vegetables, fresh basil, and a and a tasty lemony yogurt dressing. 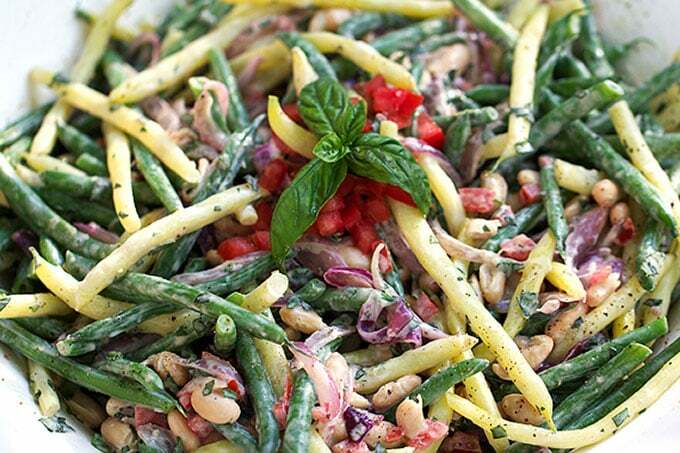 A great side dish for parties or picnics. Summer is a time when fresh seasonal produce dictates what I cook. 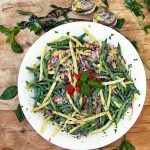 Here’s how I like to celebrate summer’s bounty of beans: three bean salad made with green and yellow beans. 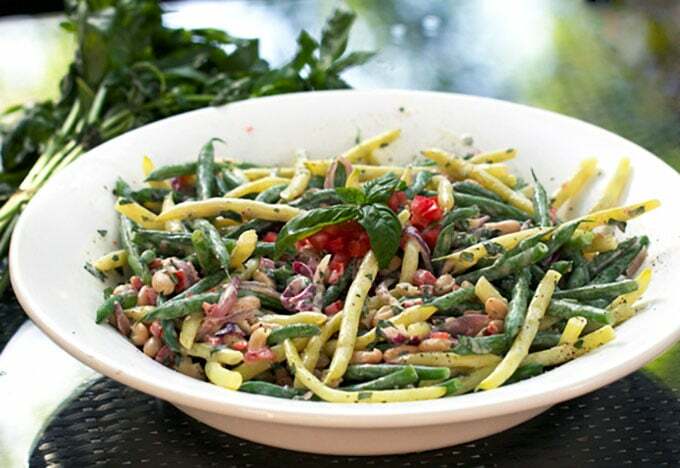 The beans are blanched to crisp-tenderness and dressed with a simple lemon-yogurt vinaigrette. I toss in canned cannelini beans for their rich creaminess and chopped fresh tomatoes and slivered basil for even more summery goodness. 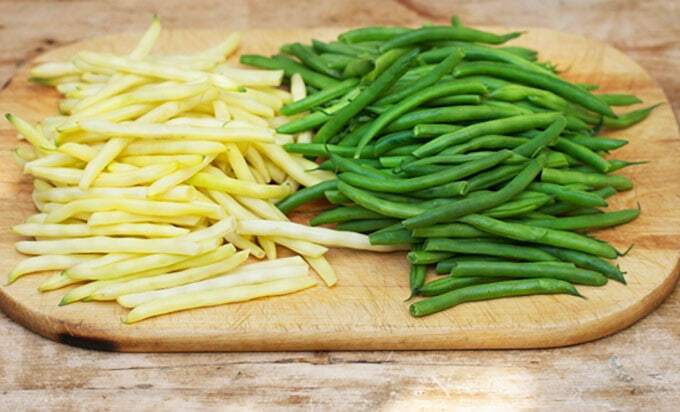 When green and yellow beans are in season, they are hard to resist. I like to keep them whole for salads. I just wash them and snip off the root tip. Then I cook them for just a few minutes – enough time to tenderize them without dulling their bright colors. 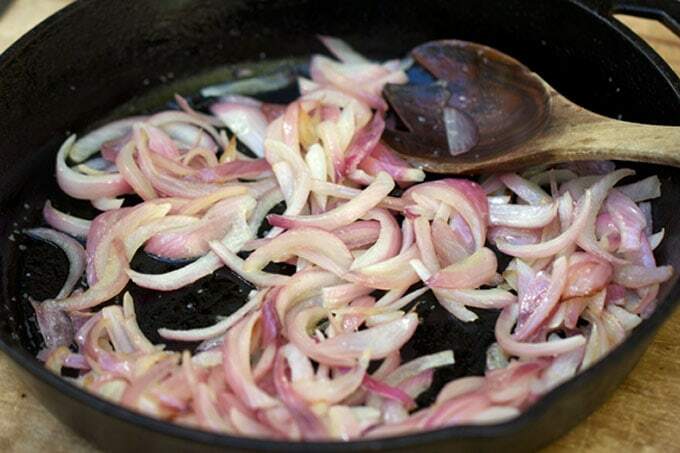 Cooking red onions for a short time in a little olive oil brings out their natural sweetness. Fresh basil is a key flavor in this salad. Plum tomatoes add color and texture. I adapted this recipe from one by Matt Wilkinson – a Melbourne-based chef with a flair and passion for vegetables. His cookbook – Mr. Wilkinson’s Vegetables – jumped off the bookstore shelf at me. It’s so appealing – from the beautiful typography to the healthy, interesting recipes. Wilkinson’s philosophy is to build a meal around fresh seasonal produce. His recipes are not strictly vegetarian. Fish and meat make an appearance here and there, but they take a back seat to the veggies. Wilkinson also shares interesting veggie history and advice for the gardener. For example, I learned that the roots of bean and pea plants are loaded with soil-enriching nitrogen. After you harvest beans, you should let the plant wither in your garden for a couple of weeks. Once the plant dies, Wilkinson says to cut off the top and stir the roots around. This releases nitrogen and dramatically improves the soil for future crops. This salad salad has a wonderful combination of crunchy and tender vegetables, brightly-flavored with lots of minty basil and tangy lemon-yogurt dressing. Serve it for a casual picnic, a weeknight dinner, or a fancy buffet. It works beautifully with grilled steak, chicken or Ribs. 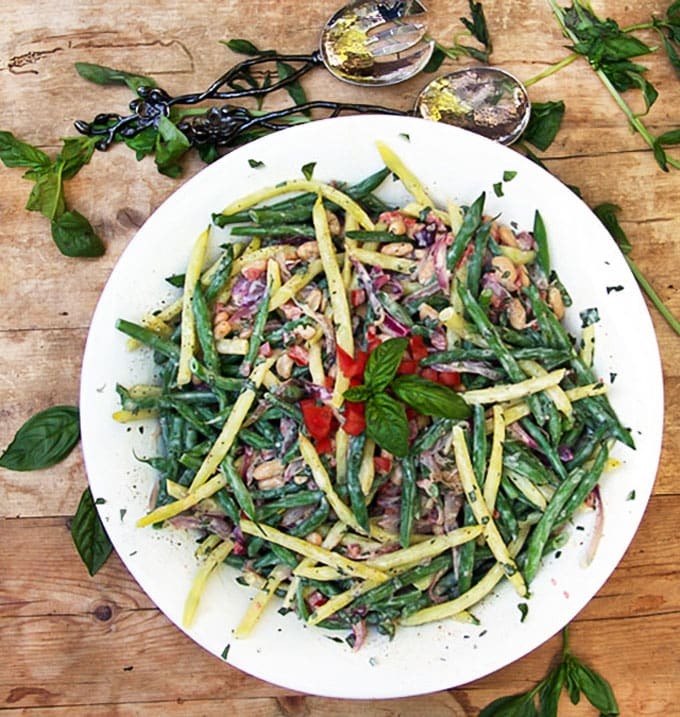 Here’s the recipe for three bean salad with creamy lemon dressing. If you make this salad I hope you’ll come back to review it and leave a comment. I always love to hear back from you! Dressing In a small bowl whisk yogurt and olive oil until creamy. Add lemon juice, garlic and salt, and whisk until creamy and fully combined. Set dressing aside. Salad Fill a large pot halfway with water and 2 teaspoons of salt. Bring to a boil. Add beans and cook until crisp-tender, 4-5 minutes. Using tongs, transfer beans to a large bowl of ice-water to stop the cooking process. Drain and refill the bowl with cold water. Drain and set aside. Heat 2 tablespoons of olive oil in a medium skillet. Add onions and cook, over medium-low heat, stirring occasionally, for 10 minutes, until soft. Sprinkle with 1/4 teaspoon salt. Set aside to cool. 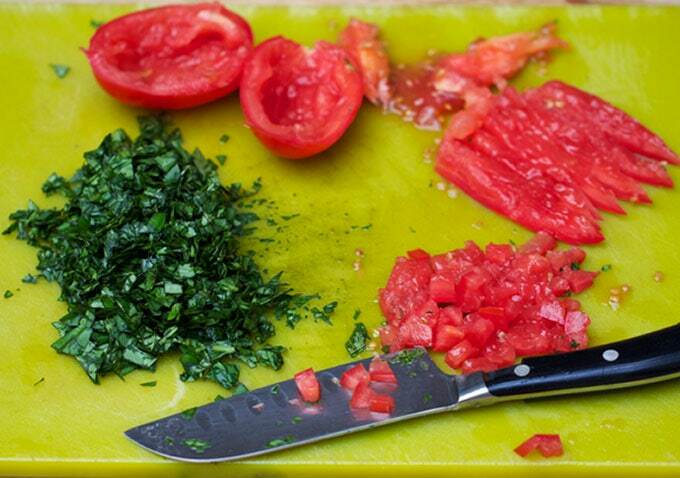 Slice tomatoes in half lengthwise. Pull out the seeds and watery pulp. Dice the flesh. Set aside. I’m so glad you’re enjoying the recipes! Thanks so much Merryn! Soooo tasty. Love the lemony dressing. With its bright flavor it is easy to pair with any number of entrees. This looks so fresh and delicious! I can’t wait to give it a try. I made this dish last night. It was delicious. It tastes even better the next day!